England surged to an innings victory over Pakistan inside three days at Headingley to put their Lord’s defeat behind them and ensure a drawn series. Joe Root’s team went into this match under pressure, with calls for senior players to be dropped and coach Trevor Bayliss’s position in doubt, but after a rallying call from their captain, they were on top throughout. Jos Buttler finished unbeaten on 80 in England’s 363 all out, and then Dom Bess (3-33) took his first Test wickets as Pakistan were bowled out for 134 and the hosts prevailed by an innings and 55 runs to secure a 1-1 NatWest Series draw. England therefore ended a winless sequence of eight Tests, stretching back to their success against West Indies at Lord’s last September and including six defeats. “We have responded well,” said Root afterwards. “We spoke about character but we wanted to make sure we played with pride and enjoyment. We learned very quickly. We ended up bowling first and it worked in our favour. A few guys stood up with a point to prove. I was really pleased. The hosts put themselves on the home straight by lunchtime, extending their first-innings lead by 61 runs for their last three wickets - thanks chiefly to Buttler - and then nipping out three of their opponents in 11 overs. Sam Curran reached 20, as all but one of those above him had already done in England’s efficient collective, but then had to go when technology over-ruled a soft signal not out and ruled a legal low catch at second slip off Mohammad Abbas. Broad got hold of a hook at Faheem Ashraf (3-60) but fell to an excellent catch by Abbas, low to the ground again but this time in the deep at long-leg. James Anderson’s arrival gave further licence to Buttler, who had become the only England batsman to pass 50 - and having been badly dropped on four the previous evening, he had another escape on 66 when Usman Salahuddin could not gather a very tough chance at deep square-leg off Ashraf. That blow went for four, and Buttler bludgeoned the very next ball for a straight six into the building site which will become the new Football Stand by this time next year. A brief but thrilling passage of play ended with Buttler unbeaten five short of a career-best when Anderson was last out, edging Hasan Ali to slip in mid-morning. Anderson had left himself plenty of time before lunch to get to work on his day job. 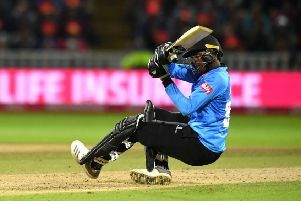 In his third over, he knocked out Azhar Ali’s middle-stump as the opener aimed to whip a full-length delivery to leg, then he had a second wicket when Bess pulled off a memorable catch at mid-off - diving to hold a Haris Sohail drive with his left hand. We spoke about character but we wanted to make sure we played with pride and enjoyment. We learned very quickly. We ended up bowling first and it worked in our favour. A few guys stood up with a point to prove. Stuart Broad (3-28) got in on the act, and went ahead of birthday boy Wasim Akram up to 415 wickets in the all-time list of leading Test bowlers, when DRS overturned in England’s favour as it detected a glove behind down the leg-side to see off Asad Shafiq. Bess bagged Imam ul-Haq as his first wicket at this level. The left-handed opener went lbw pushing forward to the last ball of the off-spinner’s first over - one that went on with the arm to miss the inside edge. It was a breakthrough which had been relatively slow coming after lunch, but Chris Woakes soon doubled up when he snaked one past Sarfraz Ahmed’s forward-defence for another lbw. There was soon a wicket too for Curran, a second in Test cricket on his debut and on his 20th birthday for good measure, when Shadab Khan edged to slip. It was a matter of time before any remaining resistance folded. Bess and Broad duly cashed in with two more wickets each as Pakistan’s last seven fell for 50 in time for a slightly delayed tea.